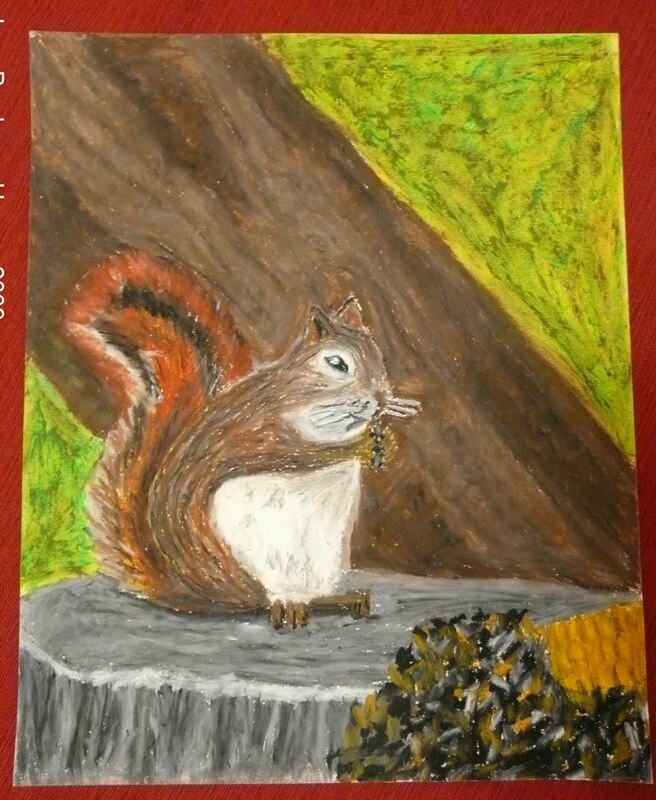 Squirrel, oil pastel on paper, 9 x 12″, 2009. This drawing was Mary Elise’s birthday card/present this year. She mentioned a while back wanting an original CBH artwork, and since we both share a love for squirrels, I thought I would make her a squirrel. Mary Elise, I think first fell in love with the squirrel when she went to Minneapolis for a conference. She was blown away by how big the squirrels were in comparison to NC squirrels. The Minneapolis squirrels have to pack on a few more pounds before the winter to survive. I have always loved squirrels. My dad’s nickname for me is squirrel, but I have always loved their erratic behavior and knack for finding food. Any animal that squirrels away food for later use, is a fan of mine. This was a fun drawing to make because of the subject matter and the interesting texture throughout the piece. Lucky Mer has a fat squirrel for her collection now.